Very Good. 0007353693 ALL BOOKS SHIPPED WITHIN 1 DAY OF PURCHASE! Fine. 0007353693 ALL BOOKS SHIPPED WITHIN 1 DAY OF PURCHASE! Very Good. Richard Scarry's What Do People Do All Day? by Scarry, Richard, 2003-02-01. Picture book. Sewn binding. Cloth over boards. Contains: Illustrations. Intended for a juvenile audience. Good. 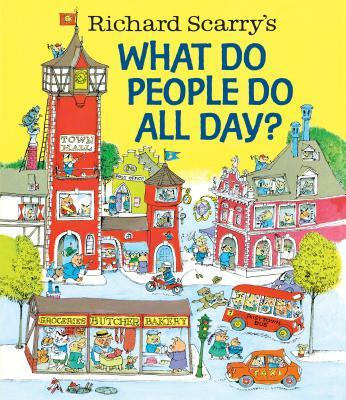 Richard Scarry's What Do People Do All Day? by Scarry, Richard, 2003-02-01. Picture book. Sewn binding. Cloth over boards. Contains: Illustrations. Intended for a juvenile audience. All Editions of Richard Scarry's what do people do all day? I have a very active 3 y.o. and these books are really the only ones to hold her attention for very long. They are so busy and relate to so much of the things she sees daily. These are wonderful travel books. We drive an hour to town and an hour home and these will hold her attention throughout the ride. LOVE these books and more importantly, She loves these books!